Is there a rule of thumb for cooking to 165 @ 275f based on weight? I’m planning on using 12-14 lb birds, brined, rubbed and I need to have them ready by 13:00 Thanksgiving Day. Most folks cook them closer to 300. I did a 24 lb bird Sunday in the cold and rain; the temps oscillating between 275 and 350, and it took all of five hours. This is what I go by on my kettle. 10-11 lbs. = 1-3/4 to 2-1/2 hrs. 12-14 lbs. = 2-1/4 to 3 hrs. 15-17 lbs. = 2-3/4 to 3-3/4 hrs. 18-22 lbs. = 3-1/2 to 4 hrs. 23-24 lbs. = 4 to 4-1/2 hrs. I always add an hour to this. Check the temps and fire at 2.5 hours, but give yourself 3.5 hours cooking + 1 hour rest to be safe. It's better to be done early and hold it in a cambro than late. Pull them out at 150-155F white and 170+ dark; let it rest 45 min or more. The carryover cooking will bump the temp up again. You might cook one ahead of time for a test run. cook a large one so you know how long it will take on your cooker how you run it. I did a 12 lb turkey on my trail embers smoker last Sunday. 3 hrs @ 350 got me to 170 thigh temp. Since my Q-Master senior ATC has a holding mode to prevent over cooking I wrapped it in foil and left it on another 45 min. It was super moist and tender, dark golden brown skin, and just the right amount of smoke. I used three med chunks of hickory. I used a drip pan with the neck and giblets along with chicken broth and it made a fantastic gravy. here is a picture @ 2 hr mark before basting with drippings. We agreed that it was the best smoked turkey we had ever cooked. Since it was an enhanced bird I did not brine, only seasoned lt. This worked well for me, Let us know how yours turns out. At first I was hesitant to try the high temp smoke but the way it turned out the I will be doing it again. 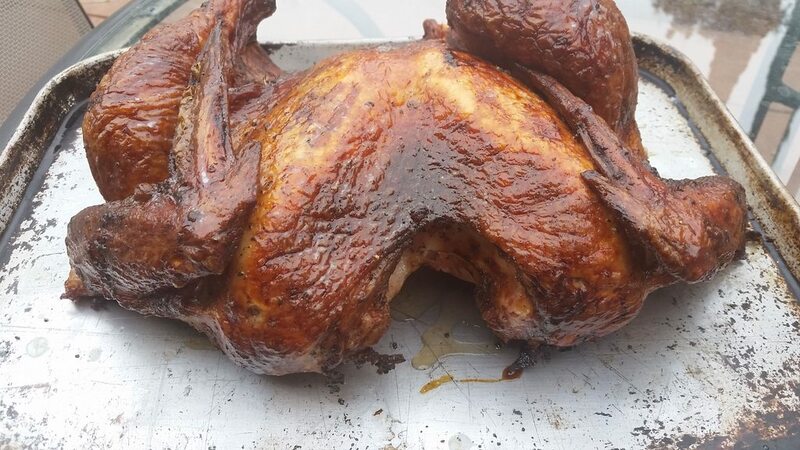 The last time I smoked a turkey it was in a Brinkman electric and it took almost six hrs and it was over smoked and not near as moist as this one. If you think about it when we oven cook a turkey we usually cook @325-350. I also think the basting and then the foil wrap contributed to the moistness of the breast meat. For my next smoked turkey I want to find a fresh bird that is not enhanced and brine it. I also will see how smoking @ 325 works out. We had turkey leftovers tonight and it tastes just as good reheated as when it was freshly cooked. 12# turkey cooked last week on my 48” Shirley. In at 10am, pulled out at 1pm when the breast read 160. Rested for about 40 minutes and cut. Juice ran down my arm I was cutting. It was glorious. The 15 pounder I did a couple of weeks ago reached 160 internal in three hours. After that I foiled and rested it in a 150 degree warmer for two hours. It was superdy-duperdy good. I did an 18 pound unstuffed turkey, not brined, smoked at 275 - 300 range took 4 hours and man oh man was it delicious!! Used apple wood and a bit of hickory.